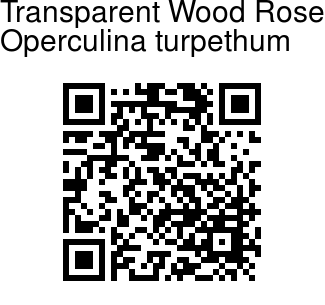 Transparent Wood Rose is a herbaceous, somewhat hairy vine reaching a length of 5 meters or more. The stems are often purplish, prominently 2- to 4- angled, and narrowly winged. The leaves are entire, ovate, 5-15 cm long, narrowing to a pointed tip, and broad, somewhat heart-shaped, or straight at the base. The inflorescences (cymes) have few straight flowers and are borne in the axils of the leaves. The sepals are green, and ovate to oblong-ovate; the outer two, 2-3 cm long, are larger than the inner three, and hairy, somewhat fleshy, and usually purplish on the fruit. The corolla is white, bell-shaped, and about 4 cm long, with the limb 4 cm wide. The capsules is rounded, being 1-1.5 cm in diameter, and contains normally 4 black, smooth seeds. Medicinal uses: In the Philippines the root, either pulverized or in alcoholic tincture, is employed as a drastic purgative. The dried and powdered root-bark is considered cathartic and laxative, resembling jalap in its action. It is a drastic purgative of phlegmatic humors and bile. With ginger, it is particularly beneficial in rheumatic and paralytic affections. 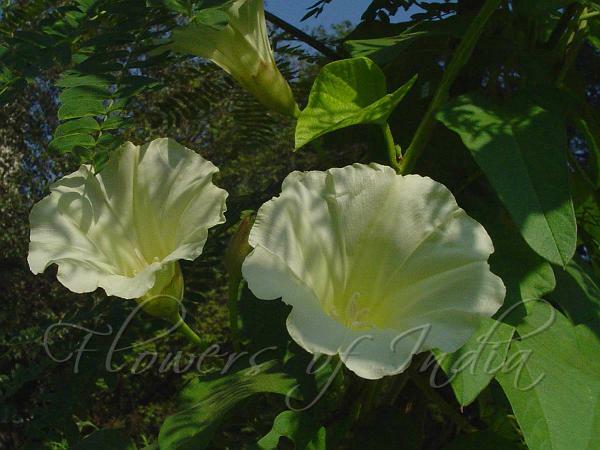 In India the fresh bark of the root is rubbed with milk and employed as a purgative.